This child care service with a website designed on UXI® shows that clarity is always the best (conversion) policy. Okay, you worked hard and got a hot prospect to your website. They’ve “landed”. Now what? Now you’ve got about 2.5 seconds to orient them. The first thing they need to know is that they’re in the right place. They must be clear about what you do, where you do it, and why they should care about your offer. If you’re thinking that’s not much time, you’re right. A website is not a story where you build up to the climax. There is no half-apology to preface your comments, no paragraph or two to get to the point, no throat clearing to make sure people are looking at you. They’ve arrived on your website; they’re already looking at you. Now, get to the point. Assure them they’re in the right place. This isn’t complicated. The opposite, in fact. Simple content and layout elements get the job done. This child care business made these changes by using the UXI® website template, and saw their conversion rates blast-off. Let’s take a look. In 2.5 seconds, you know where this business is, what they do, and why you should take action. This layout and content are important because so many websites do the opposite. They start with some vague statement of quality, then the “bear with us for a moment” story about who they are and why they got into business. People won’t bear with you. If you don’t get to the point and orient them immediately, they’ll just leave. 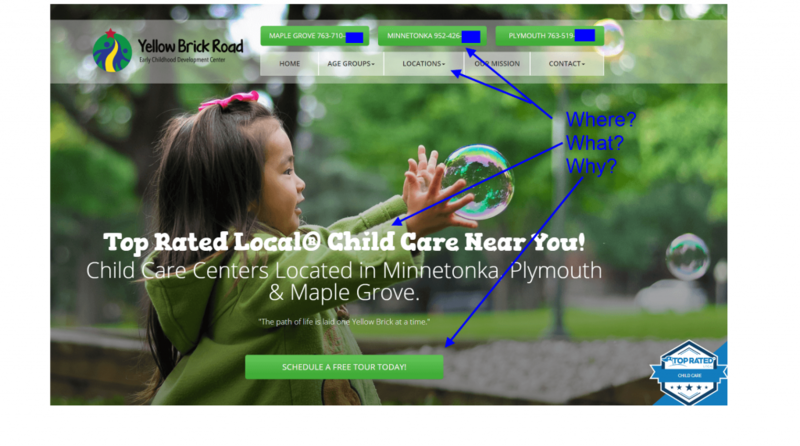 Beyond just making sure people know where the locations are and what they do, they build trust with the “Top Rated Local® Child Care” headline, and also the widget with reviews. Then they motivate action by offering a free tour. People looking around for services of any kind love (and respond to) the word free. Healthy conversion rates with high quality leads. If your business has multiple locations, show where you are with phone numbers on your homepage. Make sure your headline explains what you do instead of making a vague value statement. And make sure your call to action is specific and enticing. Then watch those conversion rates go up. Learn more about child care marketing. 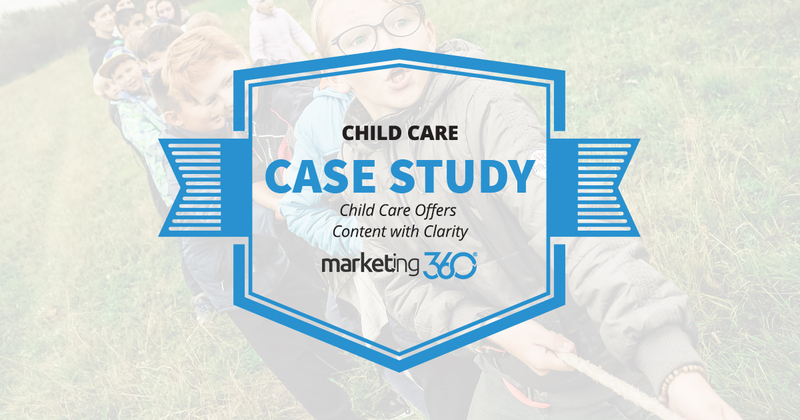 Read another child care marketing case study.